As always with one of these installments, I must begin with a warning. The following is overly detailed bike crap of interest only to the mentally disturbed and me, not that those are mutually exclusive. Continue at your own risk. I have a real thing for super-smooth and some would say over-priced headsets. My fixed gear had a Cane Creek "Solos" headset (how fitting, yes?) that was superb - the bars were almost too floppy, they turned so effortlessly, without a shred of play when doing the front-brake-on test*. Cane Creek doesn't make the Solos any more and appear to have replaced it with their 100 series. The star nut and top cap pictured were not included with the headset - had to buy it separately. The cost of all pictured was 101.97 CAD all-in, shipping included. Thus far I have eluded paying tax or duty on my purchases from the UK. I get free shipping for orders over $99 CAD, so I've been keeping the orders value as close to that as possible in the hopes that a lower $ value makes them of less interest to customs. In addition, Chain Reaction has a "regular mail" option which is less likely to get automatic attention at the border. These things combined have helped me so far, I think, though shipping is slower and I can't track the package. Anyway, my family members were mortified that these little things cost a hundred bucks. I guess they would have really freaked had I bought a $200 King! 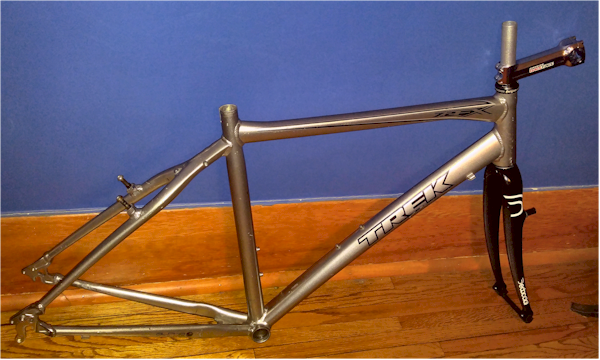 First, I just took my new parts and dry-fit them to the fork and frame to make sure I hadn't messed up. I had not. Yay!!! Next, I decided to try to be more responsible and figure out how to press the cups rather than whack 'em into place with a piece of wood and a hammer like the last time I did this. I used a couple of videos by RJ The Bike Guy to guide me in making and using a headset tool. I don't see much use in making videos of myself doing stuff I learned from other videos. Things went about the same as they did for RJ, and now I have a bike frame and fork that are attached to each other! The stem in the picture is a flashy silver Race Face Deus XC that I bought years ago on Ebay for my fixed gear build. I ended up using the exact same stem, but shorter. At 130mm it may well be too long for this build, but I hope not because love how it looks and I don't see silver ones like this around as much now. We shall see, I suppose. As you can see, the fork is still uncut and will remain so until I can play around with bike fit, figure out how high the seat will be, etc. Only then will I make that fateful cut, insert the necessary spacers and install the star nut and cap. I know I have mentioned brand names and retailers in this post. Please know I have received nothing from anyone for writing any of this. * A properly installed/adjusted headset will allow the bars to turn smoothly and easily, and have no "play" when the front brake is applied while attempting to rock the rock the bike forward and backward. The best headsets had needle bearings in at least the lower part. Because they last forever, you can't find many (if any) anymore. The world champion for best value in a threadless, 1 1/8-inch headset was the old FSA Orbit UF. They switched it to angular contact bearings a few years ago, so it's gone now. Needle bearings spread the load realistically in a headset, which is why they last forever. No matter how you tweak a ball bearing, it is still point-loading the race. Since a headset needs to swing freely, but not rotate fully, ball bearings have never been the best choice, even though they've been the dominant choice. That FSA Orbit UF came up in forums I read before making my purchase; as you say, I looked but did not find. I think I understand what you mean about point loading and not needing to rotate fully, but I'm off to look up needle bearings now. Thanks 'fiend! Keep in mind that there are many 50+-year old bikes with OE ball bearings in headsets. Sometimes an inferior choice (ball bearings) is still better than the job demands. Unlike wheel bearings or crank bearings, headset bearings don't get loaded constantly by rotating components. 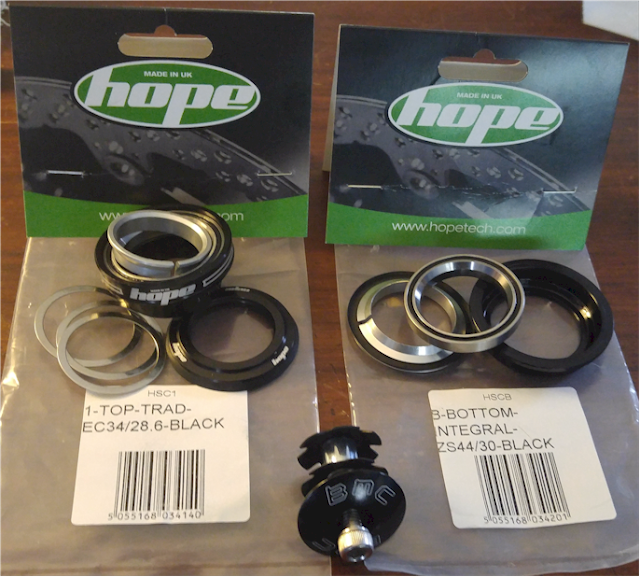 About the only bearings less critically loaded than headset bearings are those in freewheels.